CoreOS is a new operating system which is ready for the cloud computing in the world of servers. That is what written in details. CoreOS could be the operating system of the future for developers. For those not familiar, CoreOS was born in a garage in Palo Alto by Alex Polvi (CEO and co-founder) which is flanked by three other employees- Kroah-Hartman (who works for the Linux Foundation), Michael Marineau and Brandon Philips, CTO of the project. And like all the great successes of Silicon Valley (also Dave Packard, Steve Jobs and Sergey Brin started in a garage), CoreOS has received Capital funding to proceed with the operating system development. CoreOS : Why it Returned to Be interesting? But what was so interesting CoreOS so as to attract the attention of analysts? The answers to this question are varied. First, the mastermind behind the OS: Alex Polvi is the same developer of Cloudkick which was subsequently acquired by Rackspace which also as a company in 2010 and has resulted in the platform Rackspace Cloud Monitoring. Polvi started from ChromeOS, the operating system developed by Google around the Chrome browser, to get a lot more. As simplistic, CoreOS could be called a Linux distribution designed for server environments, but unlike the Linux-based products already reserved for the sector and enterprise servers, CoreOS only provides the Linux kernel and systemd, which is the process manager to start essential services at system initialization. Nothing more. In practice, this operating system is designed for customers who need to start and manage clusters of hundreds of servers and therefore ranks as a Linux server for mass deployments. And, in a very simplistic way, we could say that CoreOS bundles in a single location, allowing to accommodate infrastructure similar to Amazon and Google on your computer. Relatively speaking, this comparison is not out of place and makes us understand the power of this highly scalable operating system that would not just savings for startups, especially those of cloud computing. CoreOS therefore provides the necessary infrastructure to accommodate the components of any Web application. 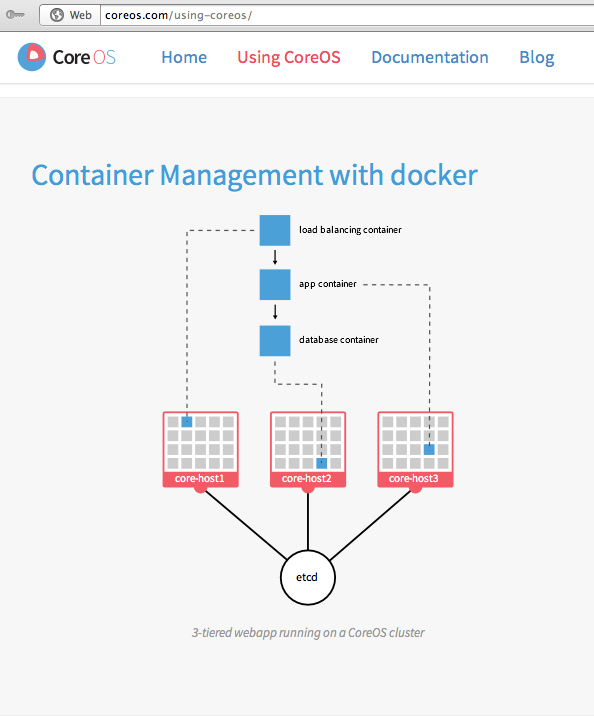 CoreOS uses Docker and as explained in official website, the choice of containers, unlike the virtualization, allows to better manage the performance of the machine and to distribute the same configuration on different hardware. CoreOS also draws attention on ChromeOS with regard to the question of updates : the operating system supports automatic updates in the background and does not create problems of data inconsistency, because it works on two disk partitions, activated alternately one at a time. The inactive partition can be updated offline, so you have to perform a swap disk and reboot to proceed with updates. The restart takes half a second. Finally, CoreOS uses a read-only partition for the file system and includes the component etcd as a distributed service configuration. Beyond this success in the community, the awards for CoreOS derived from over 1300 companies that have expressed interest in the platform. Cite this article as: Abhishek Ghosh, "CoreOS : Cloud Computing and Operating Systems," in The Customize Windows, November 18, 2013, April 23, 2019, https://thecustomizewindows.com/2013/11/coreos-cloud-computing-and-operating-systems/.